LUSH Fresh Handmade Cosmetics Canada ~ Spend $65.00 and get the free bubble of your choice!!! Any­one who has ever pur­chased Lush Cos­met­ics Canada bub­ble bars knows that they are a fan­tas­tic treat for your skin. I am addicted to every­thing Lush!!! Shop online now to get your free bub­ble bar when you spend $65.00. Offer ends on Novem­ber 2nd. Make sure to enter Promo Code BBSFREE at the check­out. Happy shopping!!!! Free bub­ble bar offer ends Novem­ber 2, 2009. 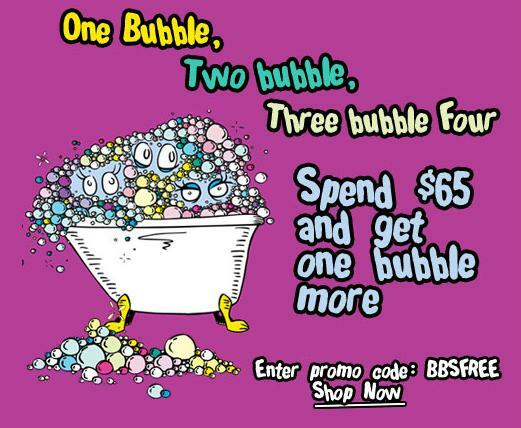 Enter promo code BBSFREE at check­out and you will prompted to select the free bub­ble of your choice. Max­i­mum 1 free bub­ble per order. Offer lim­ited to avail­able inven­tory. No sub­sti­tu­tions or rainchecks. Orders must be placed by 12 noon (Pacific Time) Novem­ber 2, 2009 to qual­ify. Gift cards, ship­ping and taxes do not count towards order total for offer eli­gi­bil­ity. Promo code is not trans­fer­able. May not be com­bined with any other offers, gifts, dis­counts or pro­mo­tions. Not valid for pur­chases in LUSH stores or prior purchases.